This was the first time I was able to visit a McDonald's in Thailand since the review of the Kapraw Chicken Rice last year. This time around I had the Nam Tok Rice Set, and you had the option of ordering it with Chicken, Beef or Pork. The only reason I chose beef was that a Thai high-school student ordered beef right before me, so I thought I would follow suit. Even though this McDonald's was heaving with people, I still had to wait about 8 minutes for my food to be delivered to the table. The manager brought me my rice, and apologised for the delay, giving me a free Coke for the wait. I was in the same situation as when I ordered the Kapraw Chicken Rice last year, as these rice dishes do not have an English translation on the menu, so I was ordering blindly. But as pleasantly surprised as I was last year with the flavour of the food, I was more impressed this year. It had a wonderful mixture of spices and tastes, it was hands down one of the best McDonald's meal's I've had. I would even go to say, that it even tasted better than the street noodles I had later on in the afternoon (street noodles are my favourite food - anyone who travels with me knows that). I pulled up the Wikipedia article on nam tok later on, just so it could help me pinpoint all the flavours that I was tasting. Apparently the nam tok 'flavour', is made with ground roasted rice, ground dried chillies, fish sauce, lime juice, shallots and mint leaves. These ingredients were mixed together with a cut up beef patty. The only downside to the meal was the size, last year, the meal filled an entire plate, this year, it was about the size of an airline meal. The presentation was better last year and it was served with real cutlery, and the rice was scooped nicely onto the plate as opposed to the plastic disposable cutlery and tray used this time around. 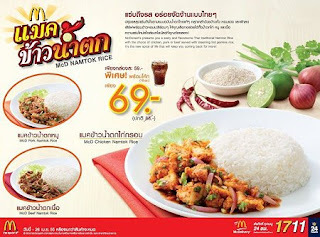 Next time I'm out with my Thai friends, I'll be sure to go try an authentic one, and I recommend you to do the same. They also had a 29THB ($0.93) Ham and Egg pie, but I already tried this abomoniation a few years earlier in Beijing, and didn't want to waste my money on it again. Other promotional items included 9THB ($0.29) dipping sauces for their fries - Wasabi, Mayo, Cheese and another that I forget. But sadly my 69THB rice set did not come with fries, so I didn't try any of the sauces, hopefully they are still available next time I'm through BKK.